At a special ceremony at Jana Kala Kendraya (Folk Art Centre) in Battaramulla, Colombo, Sri Lanka a global plaque been presented to the Speaker of Parliament and Minister of Environment by Marco Gonzalez, Executive Secretary of UNEP’s Ozone Secretariat. This is one of six events worldwide to mark the 25th anniversary of the Montreal Protocol on Substances that Deplete the Ozone Layer — the world’s most widely subscribed international law. Since it signed and ratified the Montreal Protocol in 1989, Sri Lanka has been active on several fronts to phase out various industrial and agricultural chemicals that damage the ozone layer – a natural occurring atmospheric phenomenon that protects all life from the Sun’s ultraviolet rays. Among the many accomplishments is introducing the world’s first ozone friendly tea. The May 2011 launch of ‘Ozone Friendly Pure Ceylon Tea’ logo highlighted a remarkable success story of a developing country complying with a global environmental treaty while also enhancing a major export industry. 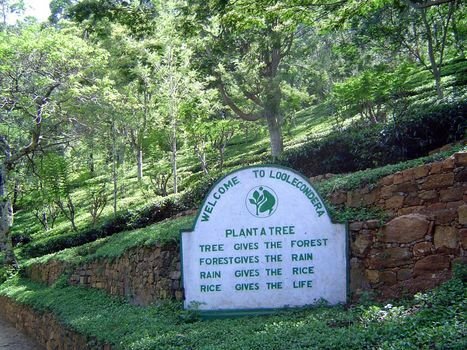 We have initiated Corporate Social Responsibility project to expand Ayurvedic Herbal Reforestation in Sri Lanka. Any product you buy from us contributes to this great cause. Please help us to save herbal plant species as we intend to sponsor one million plants in next 5 years, of Aralu, Bulu, Nelli, Madan, Kubuk, sandlewood, margosa, belli (Aegle marmelos) , ranawara (Cassia auriculata) and many other varieties. By Serendib Herbal Tea Exports in Serendib Diabi Tea, Serendib Herbal Tea Exports on January 11, 2013 .